Located on a cliff edge, overlooking the Pacific Ocean and facing north east, this stunning house enjoys spectacular views while still close to neighbours. In 2011, a family approached our firm asking for a "seriously cool" beach house. The brief from the client was for an exciting house, which took advantage of the widespread panoramic views of the Pacific Ocean, and the breezes and natural conditions of the site. The client was extensively involved throughout the design and construction of the house. 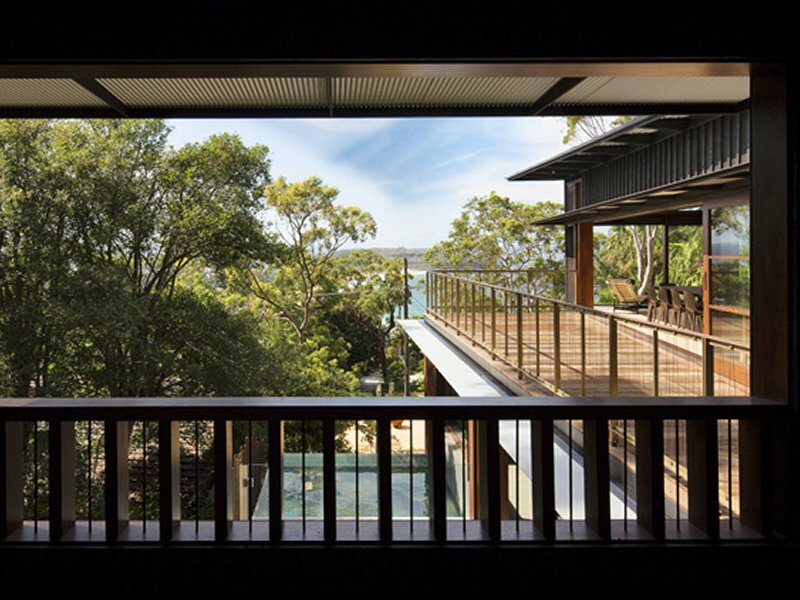 The brief resulted in a house split into two pavilions, linked by a deck which expands and fans out to the view. 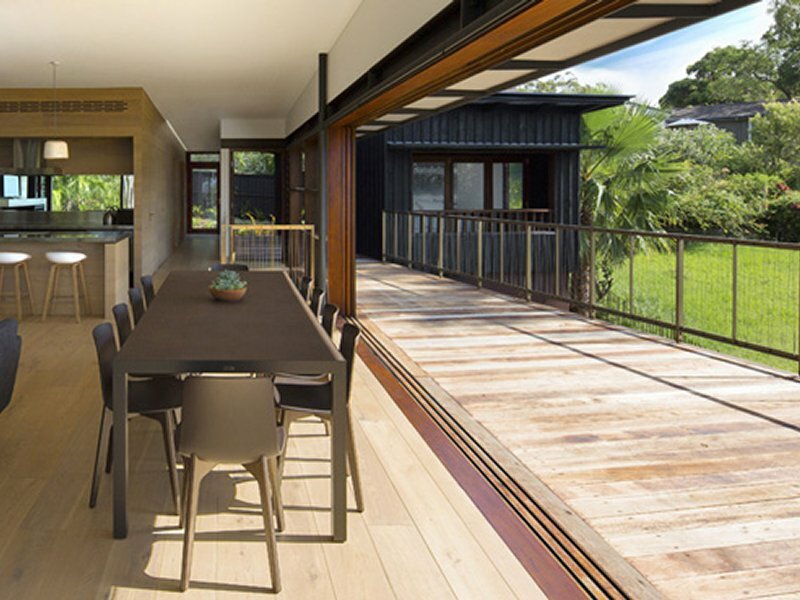 The first pavilion contains the living spaces, kitchen, family bathroom and bedrooms, with a casual living area at the lower level adjacent to the small plunge pool. A hidden door into the second pavilion reveals the master bedroom suite, which sits among the treetops, overlooking the swimming pool and northerly view. The main living area is light and spacious, contrasting with the modest scale of the bedrooms. Key to the design is the idea of the family being together in these living spaces, entertaining and relaxing with family and friends. 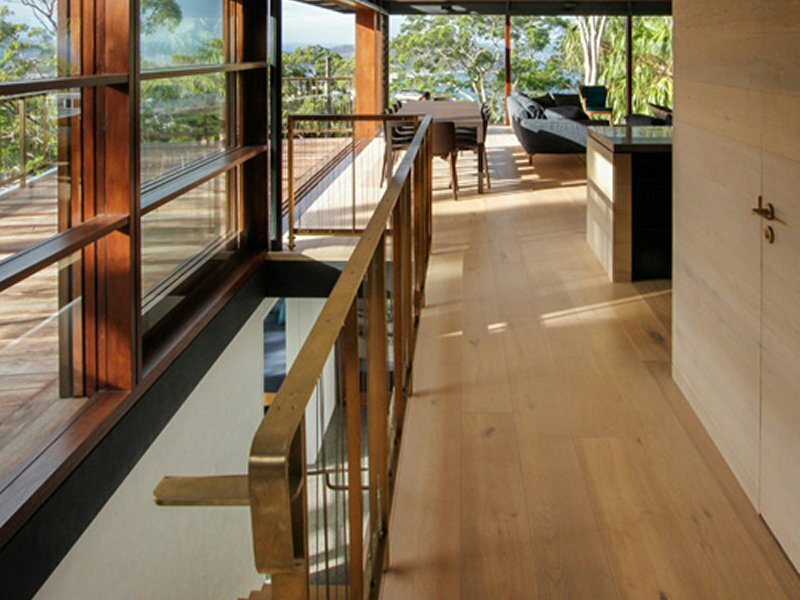 From the main living area, a large expanse of stacking glass paneled doors slide away to seamlessly connect the indoors with the outdoor deck. This idea of indoor/outdoor connectivity is key throughout. The house is located at Palm Beach, Sydney, where houses were traditionally painted with black sump oil to protect the buildings against termites. This house is a modern interpretation, being clad in black burnt timber, charred using the traditional Japanese Yaki-Sugi method. Treating the boards in this way seasons and helps protect the otherwise vulnerable wood. The timber acquires a unique charred texture, not dissimilar to the patternation of crocodile skin. 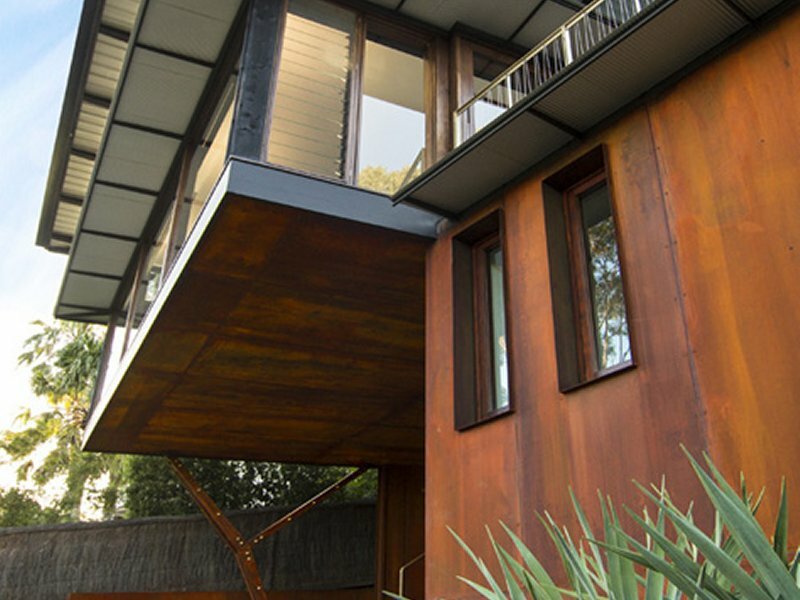 Weathered steel sheeting was also used on the lower level of the house, which creates a warm and vibrant orange-red. The palette of colours used for the house, from the oranges to the reds, browns and blacks, resonates with the Australian landscape. 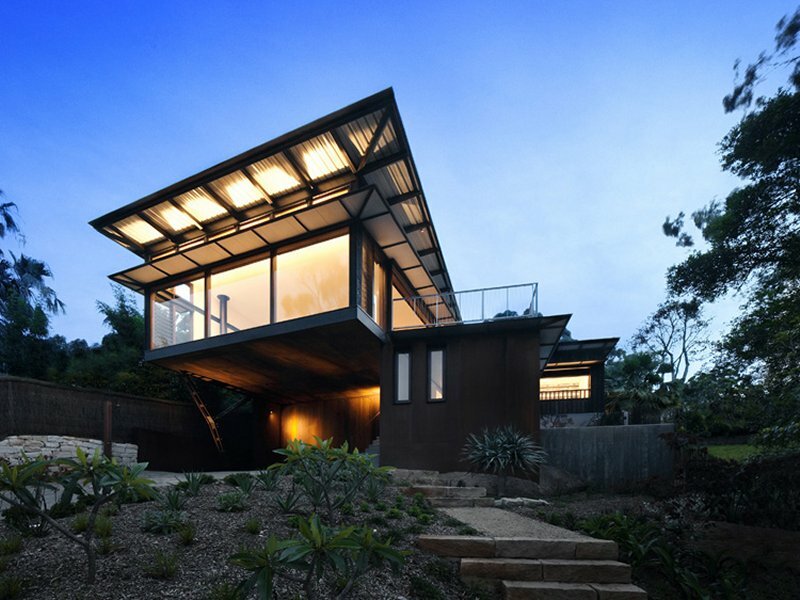 Casey Brown Architecture are a small studio in Sydney, Australia devoted to creating a contemporary architecture through an organic understanding of building in direct response to climate, topography and lifestyle. This perspective creates a preference for lasting architecture of unpretentious functionalism using natural materials and expressed structure. An existing weatherboard cottage on the site created an exciting siting opportunity. Rather than locating the new house at the lower point of the site, it breaks the pattern of the street, sitting high and away from any neighbours, giving a strong sense of privacy and retreat.The main living areas of the house soar out towards the panoramic water views, giving the house a dynamic and striking appearance. 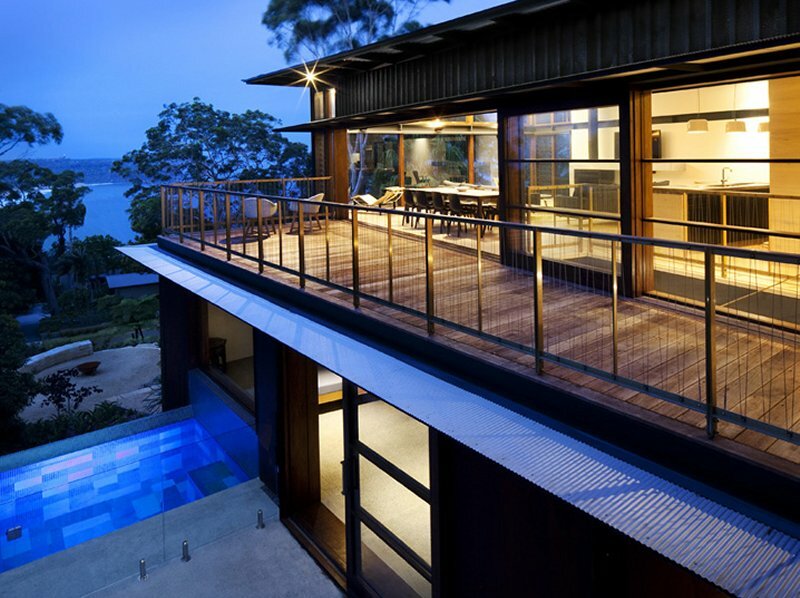 Large expanses of glass to the north capture the spectacular views to the Pacific Ocean, Palm Beach and the Barrenjoey Light House. Creating the burnt timber cladding presented the builder with a unique challenge, as it is a relatively untried technique in Australia, and particularly by using the traditional method. The process is quick, dramatic and requires precise timing. Cleaning the timber with a wire brush after it was burnt resulted in the builder looking like a coal miner! 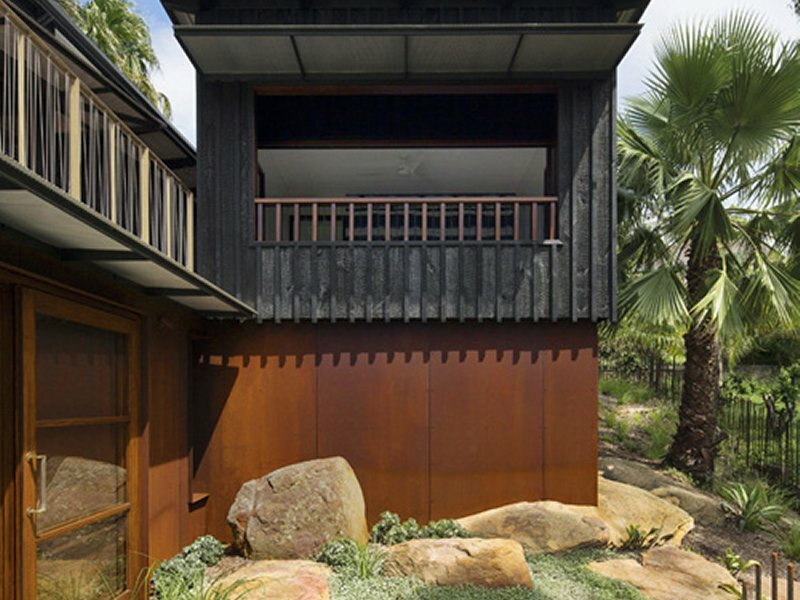 The Yaki-Sugi timber, the use of weathered steel and the positioning of the house cantilevering out from the site are all highly unique to this house. This project represents a dramatic new family beach house with many unique features, from the overall layout, to the relationship to the site, to the use of materials. One of the most special moments in the house is arriving via the steep path and sandstone steps, which take you upon arrival underneath the dramatic cantilever of the living space. 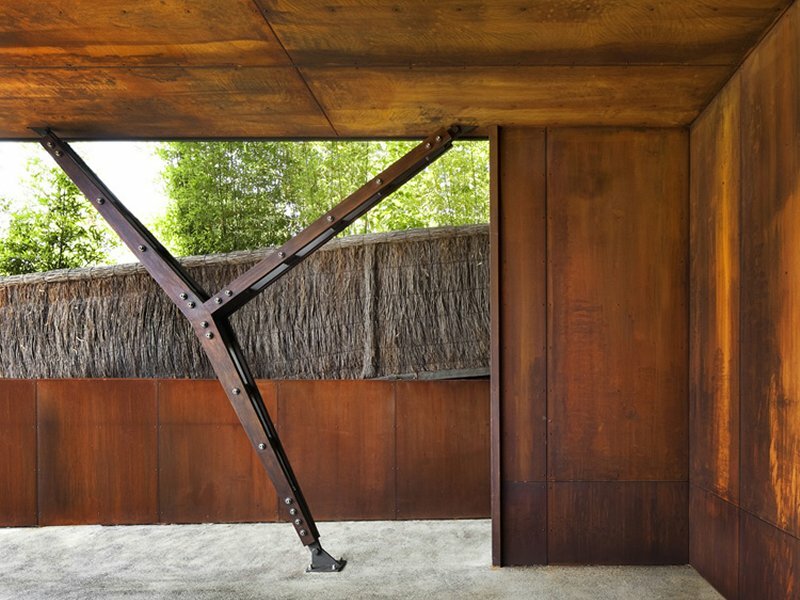 This luminescent space glows with the rich reds, oranges and browns of the weathered steel. A single Y-shaped column, delicately formed and tapered supports the house above.